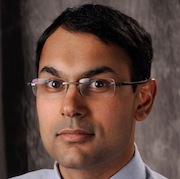 Professor Apu Kapadia is an Assistant Professor of Computer Science and Informatics at the School of Informatics and Computing, Indiana University. He received his Ph.D. in Computer Science from the University of Illinois at Urbana-Champaign (UIUC) in October 2005. For his dissertation research on trustworthy communication, he received a four-year High-Performance Computer Science Fellowship from the Department of Energy. Following his doctorate, Prof. Kapadia joined Dartmouth College as a Post-Doctoral Research Fellow with the Institute for Security Technology Studies (ISTS), and then as a Member of Technical Staff at MIT Lincoln Laboratory. Prof. Kapadia is interested in topics related to systems’ security and privacy. He is particularly interested in accountable anonymity, mobile and pervasive computing, crowdsourcing, and peer-to-peer networks. Kalpana Shankar is an Assistant Professor in the School of Informatics and an Adjunct Assistant Professor in the School of Library and Information Science at Indiana University. Her research projects focus on the uses of documents and data (digital and otherwise) in science and emergent work practices in science and technology. She is also interested in research ethics and methodologies for understanding these topics from social science perspectives. Kelly Caine is Principal Research Scientist in the Center for Law, Ethics and Applied Research in Health Information (CLEAR) and the School of Informatics and Computing at Indiana University. She received her B.A. in Psychology from the University of South Carolina and her M.S. and Ph.D. in Engineering Psychology from the Georgia Institute of Technology. Her research interests include human factors, health informatics, privacy, human computer interaction, and designing for special populations. She is a member of the Human Factors and Ergonomics Society, ACM SIGIHI (health informatics), and ACM SIGCHI (computer human interaction). She is an alumnus of the Georgia Tech Human Factors and Aging Lab, the GVU Center, and the Aware Home Initiative, and is a current member of the IU ETHOS group. She has been awarded a Georgia Tech Presidential Fellowship, a fellowship in Information Technology and International Development, and was chosen by the GVU at Georgia Tech as the Foley Scholar award winner in 2008. Outside of academia, Kelly worked as a User Experience Researcher at Google on a variety of projects including Google Health.